Place the flour, salt and baking power into the bowl of a stand mixer with the hood attachment. Mix to combine, about 1 minute. Add water, vegetable oil, milk, and brown sugar and "knead" the dough for 5 minutes, or until dough is smooth and starts to pull away from the sides of the bowl. Press dough into a disc, wrap tightly in plastic wrap, and rest in refrigerator for 30 minutes. Unwrap dough and place on a lightly floured surface. Knead with your hands until the dough is very smooth and elastic, about 2 -3 minutes. Add more flour over the surface, if necessary, and roll out into a 12 x 15 inch rectangle 1/8-inch thick. Cut off edges with a knife if necessary to make a perfect rectangle. Using a knife, or a pizza cutter, cut the dough into 1 inch wide strips lengthwise, so that you end up with 12 strips. Take one strip of dough and cover the end of one cheese stick with dough. Continue to wrap dough around stick in a spiral fashion, overlapping the edges, until you reach the other end. Cover the other end with dough and pinch edges close to fully seal. The cheese has to be completely covered with dough. Repeat with remaining cheese sticks. Add 2-inches of oil to a skillet. Heat oil to 350°F over medium heat. When the oil is hot, cook the tequeños in batches, 2 -3 at the time, turning them with until all sides are golden brown. Remove tequeños to a plate lined with paper towels. Let cool for 1 minutes, and serve immediately with guasacasa, garlic sauce, and/or spicy pink sauce. To make the Spicy Pink Sauce just mix with a fork or wire whisk until smooth and creamy. If you like a sauce with more bite, add more cayenne pepper. This sauce will keep in the refrigerator for a couple of weeks. You can find the fresh white cheese for frying at Walmart in the refrigerated section. It's called Tropical queso de freir. Maintaining the temperature of the cooking oil at a steady 350 ºF throughout the frying process is important. 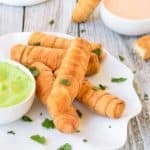 If at any point the oil gets too hot, remove from heat until the temperature has lowered, otherwise, they tequeños won't cook properly. if you do not have a stand mixer you can make the process of kneading by hand.